For Christmas my sweet neighbor gifted me an amazing cookbook, Harvest To Heat. It’s full of amazing recipes from America’s best chefs, farmers and artisans. These Crawfish-Stuffed Deviled Eggs are courtesy of chef Donald Link of Herbsaint Bar and Restaurant in New Orleans. The not so traditional filling is full of authentic Louisiana flavors. Crawfish season officially starts after the New Year… but I wasn’t able to find any fresh crawfish tail meat (Central market was even out). Luckily I found some frozen tail meat direct from Louisiana (If you can’t find crawfish substitute shrimp). 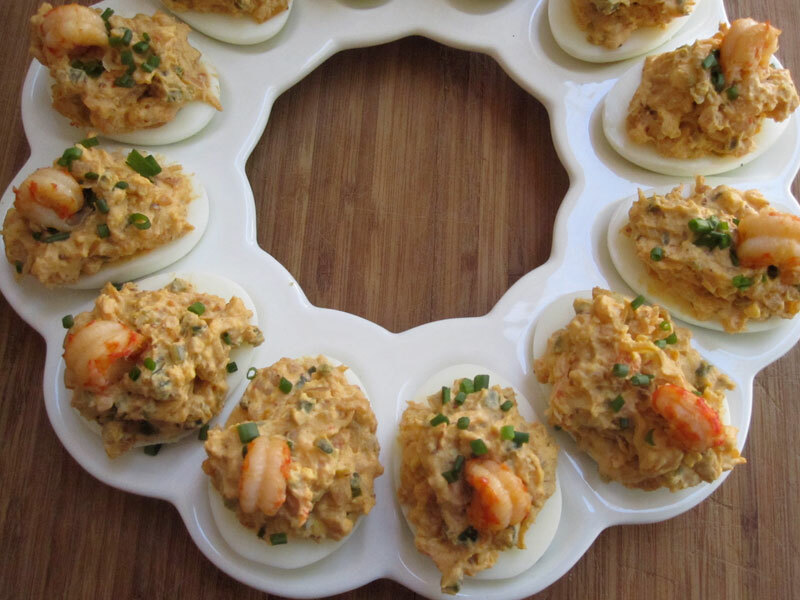 These are simple to put together even though they take a little more time than traditional deviled eggs due to the onion/pepper mixture needing cooling time… but well worth the effort. If you are prone to overcooked eggs with green yolks, try my fail proof hard-boiled egg instructions below for the perfectly cooked yellow center. These are off to the Super Bowl party to be devoured. Place eggs in a saucepan and cover them with cold water, not too deep. Place on burner on HIGH heat. Once they start to boil turn on the timer to 3 minutes. When the timer goes off, quickly take off the heat, put on the lid and reset the timer to 8 minutes. When 8 minutes are up, take to sink and run cold water over them for about a minute, let them soak a bit to cool off. Once the eggs are cool, peel and cut them in half lengthwise, separating the yolks from the whites. Set both aside. In a large skillet, melt the butter over low heat and add the onions, celery, jalapenos, poblanos, and spices. Season with salt & pepper. Cook for 4 minutes to sweat the vegetables. Add the crawfish and cook for another 5 minutes. Let the mixture cool. Put the cooked egg yolks in a mixing bowl and mash them with a fork or potato masher. Add the lemon juice, mayonnaise and mustard and mix to combine. Fold in the cooled crawfish mixture. Spoon the crawfish mixture into the cooked whites. Transfer to a serving platter and sprinkle with chives and top each with a crawfish tail. I must try this ASAP! Locate the closest emergency room before ingesting. She must be allergic to shellfish. I gonna try this bad boy for Easter folks! Making these for Easter! Wish it had a Pinterest share button!!! Holy moly, I made these today for a party and they disappeared! DELICIOUS! This sounds like a keeper. My cajun friends will love! I know I will be making it for the picnic up at the cabin. They liked the ones last year. It was all gone! I made these and they are awesome! Made these for Easter dinner. Didn't have fresh jalapeno or poblano peppers so I used a mix of sweet green, yellow and red peppers. Made plenty of filling for the eggs; had enough for a small tasting with crackers. Rave reviews from all. Did these today for the family BBQ. Used spicy brown mustard instead of creole. (My wife is from Louisiana and approved). Family loved them! Excellent recipe. I used frozen crawfish from Walmart.